Visitor instructions from the Library of Congress . 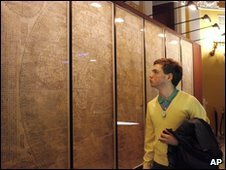 . .
A historic map of the world, with China at its centre, has gone on display at the Library of Congress in Washington. The map was created by Italian missionary Matteo Ricci in 1602. It is one of only two copies in existence in good condition. Because of its rarity and fragility – the map is printed on rice paper – the map has become known as the “Impossible Black Tulip of Cartography”. This is the first time it has been on public show in north America. 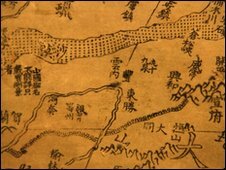 Ricci created the map at the request of Emperor Wanli who wanted it to help scholars and explorers. The map was purchased by the James Ford Bell Trust in October for $1m (£0.62m), making it the second-most expensive rare map ever sold. It denotes different parts of the world with annotations and pictures. In the Americas, for example, several places are named including Chih-Li (Chile), Wa-ti-ma-la (Guatemala) and Ka-na-ta (Canada), and Florida is described as “the Land of the Flowers”. Ford W Bell, a trustee for the James Ford Bell Trust, told the Pittsburgh Tribune-Review newspaper, that the map was “one of the two best in terms of quality, as far as we know”. “Ricci was a very smart missionary. He put China right at the centre of this new universe, this new globe, to underscore its importance,” he said. The first secretary for cultural affairs at the Chinese embassy in the US, Ti Ban Zhang, said in a statement that the map represents “the momentous first meeting of East and West”.